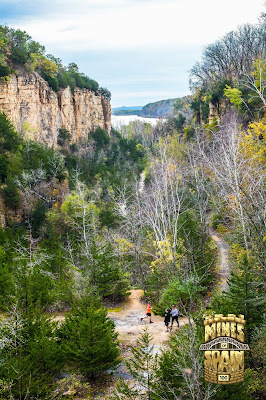 A view from above the old quarry, hard to believe it's in IA. Serendipity. That was the word that repeated through my mind as I slogged through nearly waist deep, chilly water with only my headlamp to light the way. All the while telling myself excitedly and with some degree of disbelief “this is what I do for fun!” Did I actually mean it or was I trying to convince myself that this was still fun? Regardless, that is where I found myself and I intended to make the best of it. 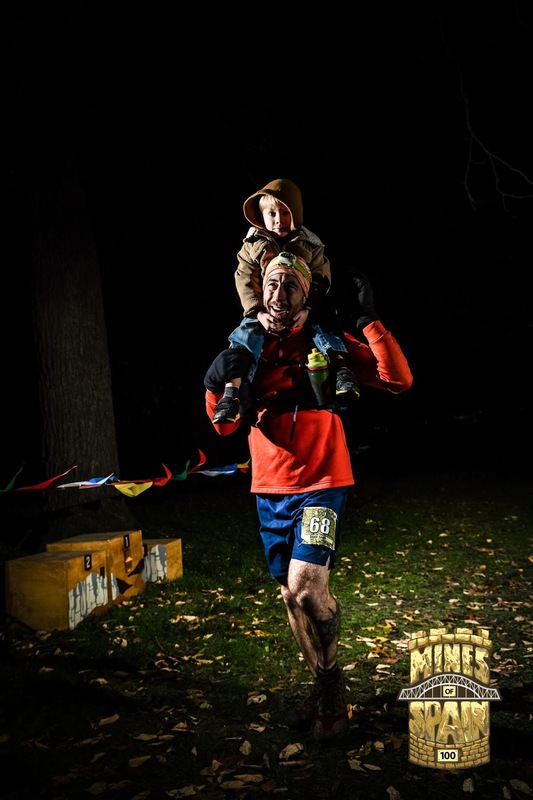 The path that led to me running the inaugural Mines of Spain 100 mile foot race in Dubuque, Iowa was strewn with many chance occurrences. 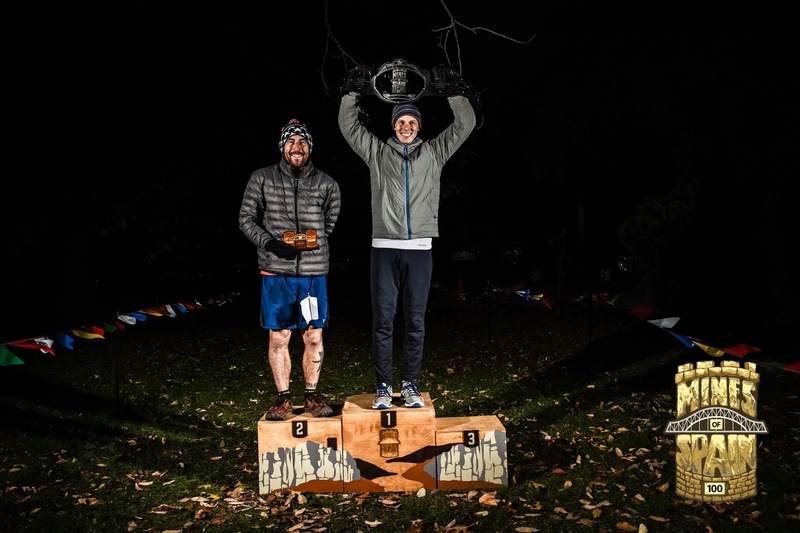 Although these events all ultimately played a role in leading me to a very positive outcome of having a great time running a really cool race, several (one in particular) of those chance occurrences felt like huge negatives in the moment that I experienced them. That one in particular that I had trouble finding any positive about was the cancellation of the 2018 Eastern States 100. At the time the news broke and for weeks after I was pretty bummed about it. However, without that event being cancelled I would not have been on the search for another 100 mile race to squeeze in before the end of 2018. 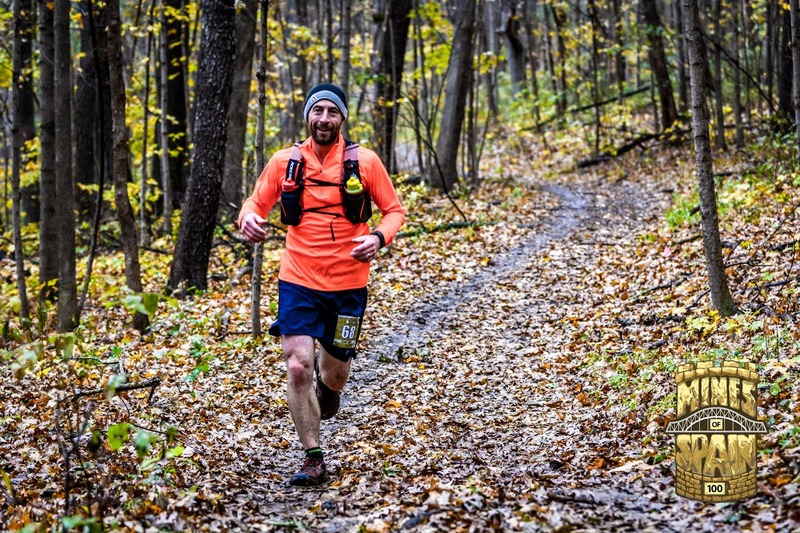 If Eastern States 100 hadn’t been cancelled, I highly doubt I would have made the trip from NJ to IA to run a 100 mile race. So in that regard, a positive was revealed due to the cancellation of the 2018 Eastern States 100. 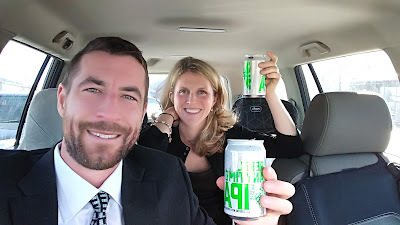 This was just one event of a much larger series of events that fell into the right set of circumstances and timing that ultimately led to me taking a road trip back home to IA to run a 100 mile race. 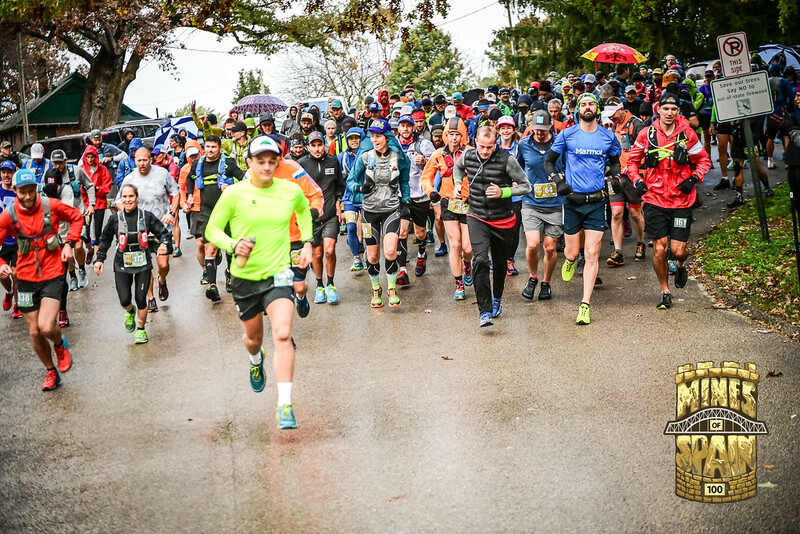 The start of the 100k and 100 mile race. I could dive deep with this race report and tell you all about my roots and childhood in Iowa, but I’ll save that story for another time. I do have to cover a few details from that era as they are necessary to explain why someone just up and decides to drive halfway across the country to run a 100 mile race. Well, it’s not “THE” starting point, but it’s “A” starting point: I received a wedding invitation from a childhood friend that I met in kindergarten and have stayed in touch with to some degree ever since. My initial reaction was that I would likely not be able to make it. Between work and family life, I just didn’t see a long weekend trip happening in mid October. However, pieces started falling into place without me even realizing. Eastern States was cancelled and I was browsing Ultrasignup regularly to find a replacement 100 miler close to home. Thankfully, my wife was searching on my behalf and was not limiting her search to the Mid-Atlantic region. In fact, she found a 100 mile race that was only about a one hour drive from Davenport, IA (where I grew up and where my parents still live) which is only about a 20 minute drive from where my friend’s wedding was scheduled to take place. That race was the inaugural edition of the Mines of Spain. Even more amazingly, the race was scheduled to start on Friday (October 19th) at 8 AM giving me plenty of time to run a 100 miler and then make it to my friend’s wedding at 3:30 PM on Saturday (October 20th). When I considered the odds of the timing and location of all of these events falling into place so perfectly, I couldn’t resist and pulled the trigger on the Ultrasignup registration page. One of the small creek crossings. 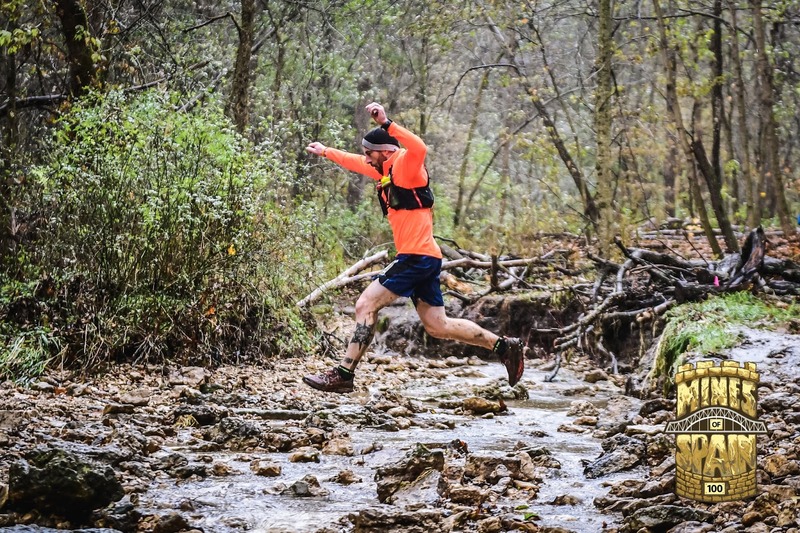 The first challenge of this ultramarathon was just getting to the area. When is the last time you made a 15 hour drive with your four and six year old kids? Well, that’s what my wife and I did just couple days before the start of the race. That long in the car is challenging no matter what and it’s even more challenging with kids in tow so we decided to make the drive overnight. We piled in the car Tuesday evening and drove straight through stopping only for gas and bathroom breaks. The kids fell asleep in NJ and woke up in IL to finish the drive into IA. It was tough, but in many ways it was better than breaking up the drive into a two day trip with the kids awake for the majority of it. 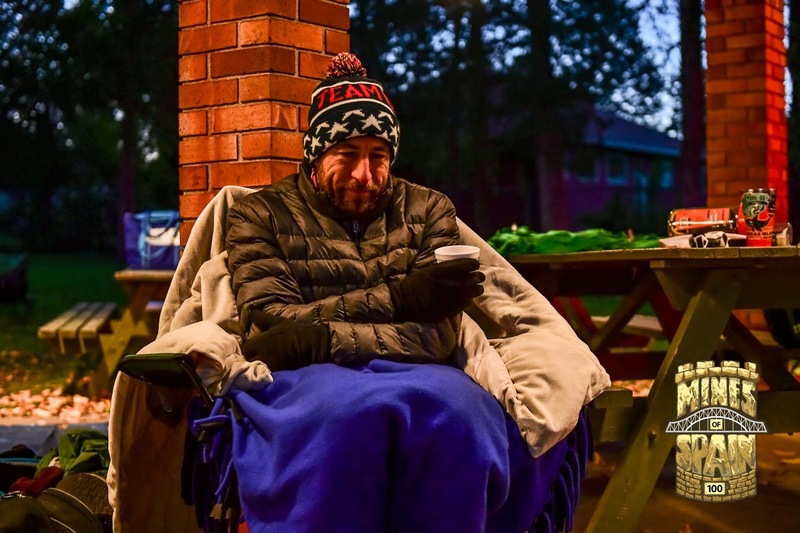 My main concern was that I would be a bit sleep deprived to start when going into the early morning hours of the race making them a bit harder to deal with. On the Horseshoe Bluff Trail running through the bottom of the old quarry. The Mines of Spain course isn’t strictly a loop or out and back course. I would call it a hybrid of sorts with a stronger emphasis on the out and back sections. 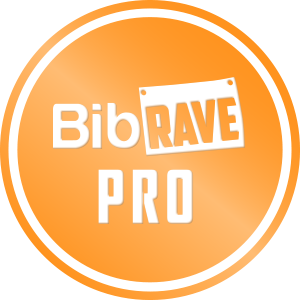 It is a 20 mile route with a few smaller loops mixed into out and back sections with three aid stations in addition to the start/finish area aid station. 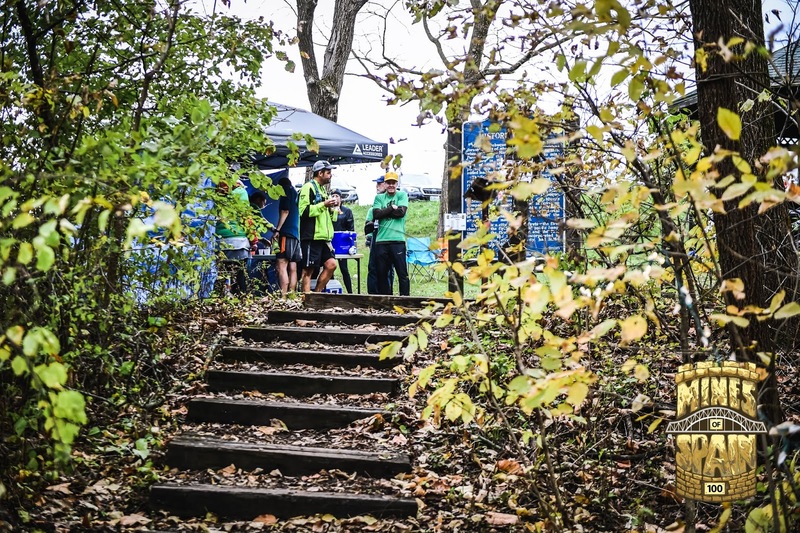 The way the course is set up allows you to stop at aid station 1 on two occasions: as the first aid station (kinda obvious) and again between AS 2 and AS 3. The stretch between AS 2 and getting back to AS1 is less than two miles, so it’s probably not really necessary to stop again, but it was nice to know there are plenty of opportunities for aid stops on the course. The course starts at Louis Murphy Park and follows a paved path down hill along a power line cut to Julien Dubuque Dr. where you run by the City of Dubuque Water & Resource Recovery Center (there’s a bit of a smell in the air around this area). This makes up about a 1.5 mile stretch after which there is one more short stretch of road running then the rest of the course is on trail. For the initial loop the RD added a very short out and back to run around the Julien Dubuque Monument overlooking the Mississippi. It was less than a quarter mile of extra distance and gave the photographers there a great opportunity to get a very picturesque photo of all the runners. After this there was about a quarter mile of trail with a lot of stairs, some metal, that I made a mental note of how treacherous they would be in the dark. After this a quick road crossing over a bridge before a half mile of trail, a half mile of road, and then a hard left and you’re on the Horseshoe Bluff Trail which in my opinion was one of the most scenic spots on the course and very unique for Iowa. 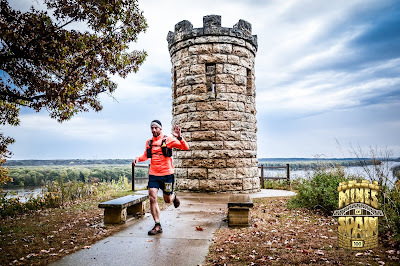 Photo from my first lap after circling the Julien Dubuque Monument. The Horseshoe Bluff Trail starts with a climb then takes you through the old quarry where lead was mined in the late 1700’s when the land was owned by Spain, hence the name of the recreation area and the race. The trail sits at the bottom of jagged rock walls on either side. The rocky outcroppings are tall, it wouldn’t surprise me if they were over 100 feet high in some instances, making you feel pretty miniscule as you follow the relatively narrow path between them. Then you come to a fork in the trail and cross a short (and slick when wet) bridge to begin the lengthiest out and back section of the course. 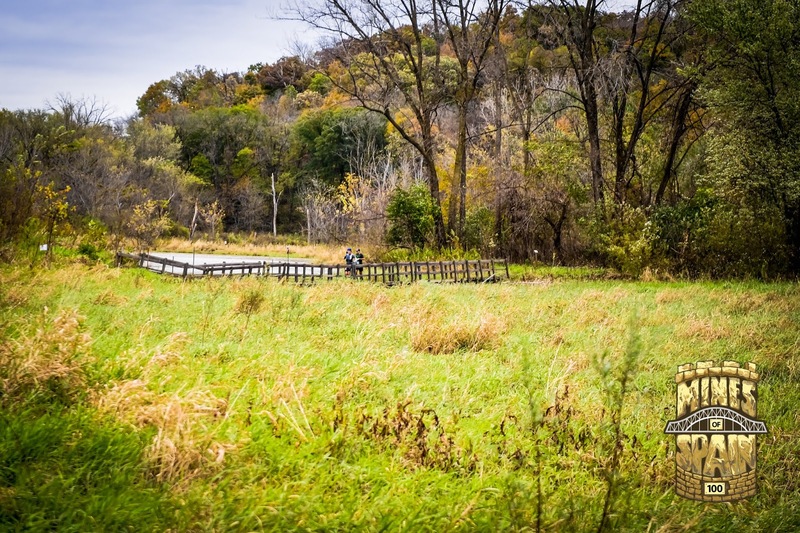 Over the course of this out and back you’ll pass through AS 1, make several small creek crossings (if you’re careful you should be able to keep your feet dry), and pass through forests and prairie grasslands dominated by big bluestem and Indiangrass. At the turnaround there was hole puncher hanging from a tree to mark your bib each time you passed. On the way back you’ll make an additional short out and back to AS 2 before returning back across the bridge and onto some new trail. From there it’s a lollipop section of the course with lots of stairs leading up to AS 3 and lots of stairs coming back down. A short out and back part of this lollipop section happened to be a bit flooded a little above ankle deep during the race for what I estimated to be a stretch of about 200 feet (I counted about 70 paces). There was no chance of keeping your feet dry here. And shortly after your return pass through this wet section you were treated to the most flooded section of the course. This section of the trail runs along Catfish Creek, a tributary which feeds into the Mississippi and is affected by water depths of the mighty Mississippi. By chance, water levels of the Mississippi were near record levels leading up to the race and serious flooding had occurred in many towns along the river. 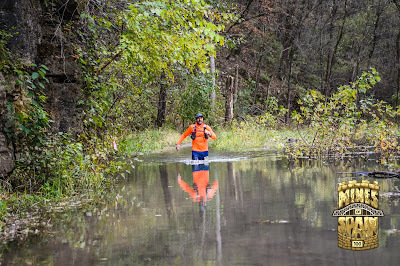 The result in regard to the race was a 300 foot or so section of trail with about three foot deep (depending on if you found a hole or not) water to wade through. Survive this and then it’s just a quick hop on the road to cross the flooded creek you just waded through, a little loop with a bit of a climb and a descent, and then you’re on your way back up the metal stairs and on the road past the water treatment facility to return to the start/finish area. The short, slick bridge mentioned above. And that’s the Cliff’s Notes version of the course overview. If it sounds a bit confusing with all the out and backs, forks, and a lollipop that’s because it is. 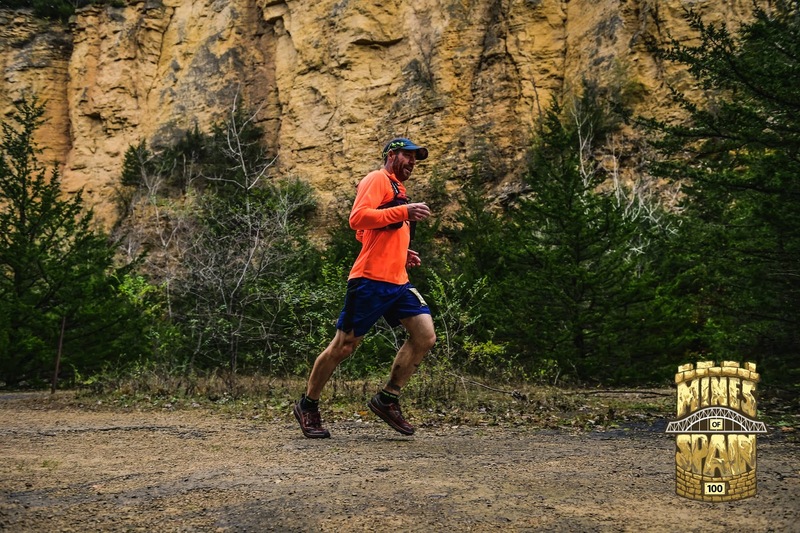 The area is made up of a lot of interconnected trails, many of which are relatively short when a 100 mile run is the goal. 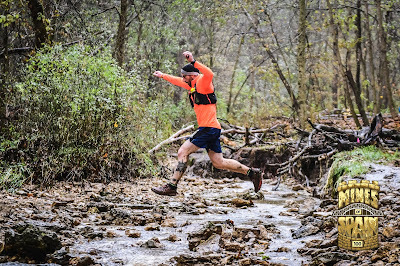 Without being familiar with the trail network, I thought the race did a great job of using the trails available to create a fun and more challenging than expected 20 mile course. Course marking was good, but even so I found myself questioning if I had taken the right turn several times during my first lap. This usually was shortly after one of the trail junctions and usually due to my uncertainty of having chosen the right turn, not due to me not seeing any flagging. For that reason, I would highly recommend anyone planning on running this race to study the course map leading up to the race. I know I regretted having not studied it and wished I had made myself more familiar with it ahead of time. Left: A small portion of the stairs leading to AS 3. Right: The least helpful volunteer at the race. My primary goal for this race was a time goal. 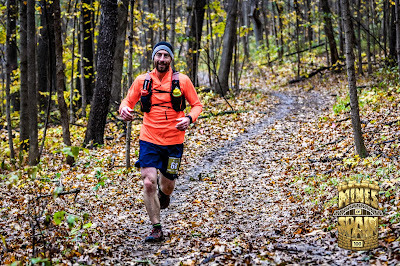 It’s hard to set a goal for a race that is on unfamiliar terrain, so I tend to error on the side of overreaching. This course had an elevation gain of 14,000 feet, so not flat and fast and especially not so by Midwest standards. I decided to shoot for a 20 hour finish, partly because the math would be easy to do during the race: 5 laps X 4 hours/lap = 20 hours. The math was easy, as it would turn out the running would be much harder. For the most part, the course is completely runnable. At least that’s what I thought for the first lap which went really well. Other than the aid station stops I think I ran the entirety of the first lap. I spent the first half of it running and chatting with another guy then he fell back a little after AS 2. This left me alone in front running in first place, an abnormal experience for me. I questioned what the hell I was doing running out front ahead of my target pace, but the course just felt runnable. I even ran the entire paved climb up the powerline cut, one of the most notable elevation gains on the course. Making it back to the start/finish AS was exciting as I arrived in under 3.5 hours, way ahead of my target pace. Even more exciting was that my parents made it there in time to cheer me on and get their first taste of what ultrarunning is. And more exciting on top of that was the fact that the second place runner came into the AS within a minute or two of me and was back out on the course very quickly. I rushed a bit and was back out on lap two hoping that I had a shot of keeping up with him. 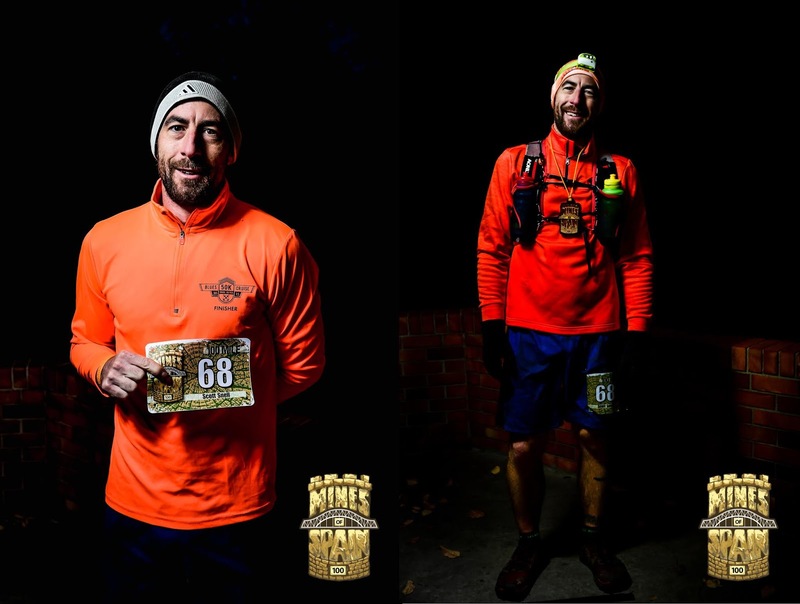 It's all smiles for the first 20 easy miles, see completely runnable. I passed him on the paved downhill after leaving the aid station and didn’t see him again until AS 1. I had sat down for a second there to relube my right foot that had developed a bit of a hot spot. 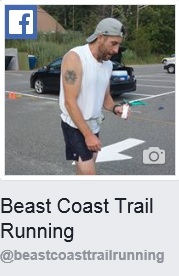 While doing that the other runner flew through the aid station and didn’t even stop to refill a water bottle. I had my doubts about catching him again at that point, but gave it a shot anyway. The rest of lap two felt pretty much as good as the first, but was a little discouraging because at every out and back on the course I realized that this other runner that I was trying to chase kept on extending the gap between us a little bit farther and farther. I believe that it was by the end of lap three that I wasn’t even seeing him on the returns from the out and backs anymore. This wasn't the deepest section and the water only got colder as the day went on. It was probably around that time at the start/finish AS after lap three that I started sliding into the lowest points of my race experience. It was dark by this point and the water level of the flooded section of the trail near the end of the loop seemed to be getting deeper with every pass. It was certainly getting chillier every time I waded through it. I had finished my third lap just under the 12 hour mark so I was still on pace to meet my time goal, but after 60 miles my body was starting to tire and the pace of my most recent lap was showing it. I conceded the fact to my wife that my time goal was not going to happen today. Then I started complaining about my feet hurting. That’s when she hit me with a shocker that I didn’t believe. She told me I was in fourth place. I didn’t argue, but I didn’t believe her either. No one had passed me, not even 100k runners. I didn’t give it much more thought at the aid station and prepped for my next lap. I put on a heavier thermal three quarters zip down and gloves. I took in some calories, pretty much just simple sugars which had been the majority of my fuel thus far. Then chewed down some candied ginger to hopefully settle my stomach which had begun to feel a little disgruntled. With that I headed out into the night for loop four. My before (left) and after (right) pics. That fourth lap took me about 5.5 hours putting me at about 17.5 hours to reach the 80 mile mark with one loop left to finish. Coming into the start/finish aid station this time I felt like I was still in a bit of a funk, but not as bad as I had been for the majority of the fourth lap. I think the lack of sleep was catching up to me as I was feeling more sleepy and overall grogginess than I ever have at any previous 100 mile attempt. But with only 20 miles to go the end was in sight which motivated me and reignited a bit of fight in me. My wife told me again that I was still in fourth place and that another runner had left the AS a few minutes before me. Last time she told me this I didn’t believe her, but I had accepted it at this point. However, like I said I had a bit of fight back in me at this point, I argued with her for just a few sentences about how that wasn’t possible. Not wanting to waste time and just wanting to get this done, I quit arguing pretty quickly and headed out from the aid station to see if I could catch any of these runners that had passed me. In hindsight, that may have been what pushed me to pick up my pace a bit for my last lap. I passed a few runners over the course of that final lap moving better and more determinedly than the previous lap. I wouldn’t find out until the finish though that they were all 100k runners. During this last lap I moved better between aid stations, but spent a bit more time refueling and enjoying the mental boost from the volunteers there. And the volunteers at these aid stations were stellar. Unbeknownst to me at the time, but I actually spent a bit of time with the legendary Ann Trason at my final aid station stop. I found out later that she was even at the race when the race photos were posted. To think, I spent my last aid station stop with Ann Trason debating whether or not to take a shot of Fireball before heading to the finish. 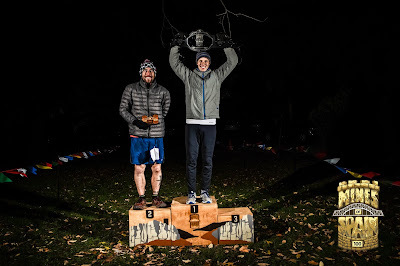 If I had known who I was with at the time I’m sure I probably would have had some other questions, but it was a very fun aid station stop with some laughs regardless. And yes, in the end I did take the Fireball shot before heading out for the last stretch to the finish. My first time to ever literally occupy a podium spot after a race! but damn that was some good hot chocolate! brought me down emotionally for that fourth lap, but it got me to push harder for the final lap. Regardless, it made those last two laps much more interesting than they would have been otherwise and provided a decent amount of laughs when I recounted the story after receiving the second place finisher award. And in the end, even though I missed my time goal, I was happy with my official finish time of 22:38:10, good enough for second overall. I made it to my buddy's wedding with my lovely wife and was even able to dance, albeit a little awkwardly.